That said, the rhetorical goal is not to mobilize the American people fully for war, on a World War II scale. Rather, in this post-draft America, presidents exhort the public to leave the fighting, and even the thinking about war, to others, to the professionals. Again, the government asks more for deference than sacrifice. In the aftermath of the September 11 attacks in 2001, George W. Bush famously encouraged Americans to visit Disney World, to go shopping, and otherwise to enjoy life. At the same time, U.S. presidents have become unstinting in their praise of the military, alternately describing it as the greatest force for human liberation in history (Bush again) or the greatest military in all of human history (Obama). Isolation from war’s burdens and costs, augmented by hyperbolic praise of the U.S. military, serves a powerful rhetorical purpose. It preempts, deters, and silences criticism of official government and military actions. It empowers the cult of the expert, as matters of war are advertised as being beyond the grasp of ordinary citizens. Information about war is kept classified or otherwise withheld from the people in the name of national security. In the U.S. media, retired generals and admirals interpret military actions and wars for the people, ensuring ordinary citizens are kept on message. And that message is clear: citizens are to support “our” troops, but otherwise to keep out of wars, which are not “ours” to own in any significant way. The war rhetoric of recent U.S. presidents is intended to turn Americans into unthinking spectators who are encouraged to root for the “home team” without considering the methods or the final score. In this, U.S. presidents, aided by a compliant media, have largely succeeded. The U.S. government refuses to give a full accounting of the horrific costs of perpetual war, knowing full well that if it did, U.S. citizens would be far less likely to support war efforts. Like his predecessors, Obama has worked to keep the American people sidelined from wars. For this he is rarely criticized by the political left. He draws fire mainly from the right, from militarists like former Vice President Cheney. In a speech before the American Enterprise Institute in May 2009, Cheney condemned Obama for using words “that strive to put an imaginary distance between the American people and the terrorist enemy.” America, Cheney declared, was at war with terrorists and other “killers and would-be mass murderers.” Yet Cheney himself resorted to euphemism when he repeatedly invoked “enhanced interrogation techniques” (such as waterboarding) in place of torture. Cheney, for all his dissembling about torture, did put a finger on a problem: America’s collective acquiescence in the temporizing of language when applied to war-making. Cheney stares unblinkingly at euphemisms like “enhanced interrogation,” which cloak the reality of bodies being slammed against walls and water being poured down people’s throats. Americans’ eyes glaze over when their government uses terms like “collateral damage,” a euphemism for killed and wounded, rather than honest descriptions of innocents blown to bits or babies crushed under rubble. Defenseless villages are bombarded from the air, the inhabitants driven out into the countryside, the cattle machine-gunned, the huts set on fire with incendiary bullets: this is called pacification … People are imprisoned for years without trial, or shot in the back of the neck or sent to die of scurvy in Arctic lumber camps: this is called elimination of unreliable elements. Such phraseology is needed if one wants to name things without calling up mental pictures of them. This last point is essential. The U.S. government refuses to give a full accounting of the horrific costs of perpetual war, knowing full well that if it did, U.S. citizens would be far less likely to support war efforts. Consider the official military names for America’s wars. 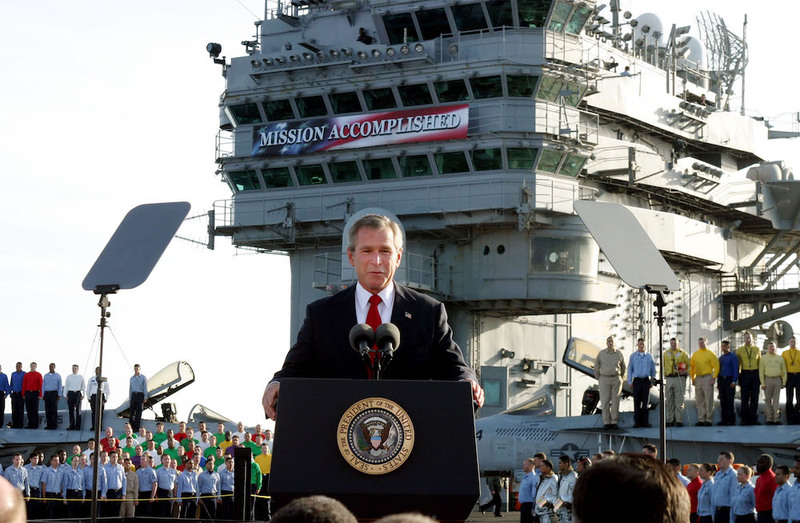 “Operation Enduring Freedom” took us to Afghanistan, “Operation Iraqi Freedom” to Iraq. “Freedom,” not war or invasion, is the key word. That U.S. troops could be an alien and invasive presence in foreign countries is denied by the very construct that they are freedom-bringers. The costs of war, especially to innocents, are rarely mentioned in America. The Obama administration recently issued its “drone report” on civilian casualties on a Friday afternoon, July 1, just before the July 4 weekend, a tried and true method of minimizing coverage by the mainstream media. According to human rights groups as well as the Bureau of Investigative Journalism, that report significantly undercounted the number of civilians killed in U.S. drone strikes, yet few seemed upset with this “accidental and regrettable” collateral damage. Couple Orwell’s insight with President Obama’s tepid rhetoric on war—his studied lack of emotional mobilization—and a pattern emerges. Constant warfare is America’s new normal, business as usual. At the same time, detachment from war’s realities serves to obscure the repetitive, Groundhog Day nature of those wars and their lack of progress. In this way, a constant state of war, real and rhetorical, is spoiling our democracy, as James Madison predicted it might two centuries ago. In seeking to neutralize dissent about war with euphemisms, America’s presidents are abetting violence both here and around the world and prolonging wars with costs borne mainly by foreign peoples who cannot use a cloak of words as shelter from its deadly realities. William Astore is a retired lieutenant colonel (USAF) and historian. He writes regularly for TomDispatch.com and blogs at Bracing Views. Primary Editor: Hattie Hayes. Secondary Editor: Andrés Martinez. *Photo by J. Scott Applewhite/Associated Press.